This Digital Tabletop Oscilloscope PKT-1200 has up to 25 MHz bandwidth. The accuracy of this high quality tabletop oscilloscope is 0.5 %. This oscilloscope can be placed on every table surface, and captivates users with its big 8” colour display which accurately analyses measurements. Due to this, up to 5 ns/DIV on the vertical part and up to 5 mV/DIV on the horizontal part can be presented to the user on the tabletop oscilloscope. The input resistance is 1 MΩ. All options are available for the user to oscilloscope due to several trigger modes. The desk oscilloscope has an automatic triggering that is why complicated adjustments are unnecessary and this feature saves time. 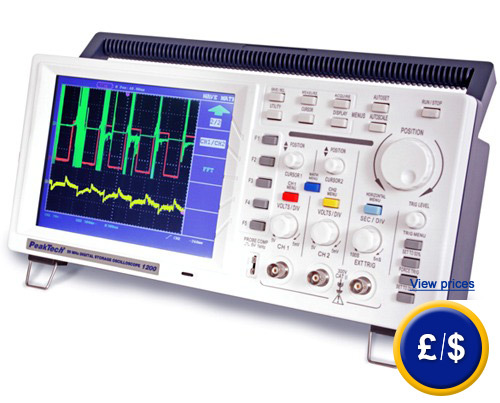 Due to easy handling and a multitude of opportunities to adjust and to measure, the desk oscilloscope is suitable for laboratories, workshops or training purposes. If you have any further questions regarding the Digital Tabletop Oscilloscope PKT-1200, see the following technical specifications or contact us: UK customers +44(0) 23 809 870 30 / US customers +1-410-387-7703. Our technicians and engineers will gladly advise you on all oscilloscopes and all other products in the field of regulation and control, measuring instruments and scales. At the following link you will find further oscilloscopes.